What stories compose your spiritual biography? How do biblical narratives echo through your own experiences? Where does your path intersect with God in both profound and mundane moments? 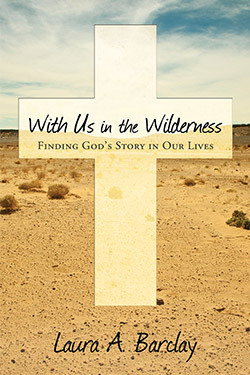 In With Us in the Wilderness, Laura Barclay shares her own stories of the intersection of the divine and the everyday, guiding readers toward identifying and embracing God’s presence in their own narratives. Through the perspective of faith, hope, love, and each of the four cardinal virtues—Prudence, Justice, Temperance, and Courage—Barclay explains how, by exploring our spiritual biographies, we grow toward greater acceptance of our stories, greater understanding of God, and greater participation in the plan God has for our lives. Laura A. Barclay has served churches and parachurch organizations for nearly a decade. An ordained minister, she earned her M.Div. from Wake Forest University School of Divinity and spent five years with the Cooperative Baptist Fellowship of North Carolina as Social Ministries Coordinator. She currently manages networking, communications, and missions for the Kentucky Baptist Fellowship. She blogs at The Winding Labyrinth. She is married to Ryan Eller, a minister and community organizer. Laura can frequently be found decked out in red and cheering for her beloved Louisville Cardinals, her undergraduate alma mater. In this series of reminiscences, Laura Barclay explores the nature of faith, justice, and community in ways that engage the reader and invite response. With Us in the Wilderness is a valuable resource for shaping spiritual formation in individuals and groups. This is that rare personal narrative—related with all the immediacy of the events and feelings as Laura lived them, but also with a clear-eyed gift of reflection that invites us into the story. The story we end up sharing with Laura is not primarily her faith and life journey, but a shared journey in which we all have a place. She invites us to rethink how all our stories can be entry points for God’s justice, reconciliation, and compassion. Laura Barclay’s stirring spiritual memoir, With Us in the Wilderness, is cool spring water to a dry, barren soul. Read it and remember we serve a God who invites us to question, to seek—for it is in our doubting that God reveals himself best. Reverend Laura Barclay is a gifted minister and writer. In this well-written, but entirely relatable book, she generously shares moments from her own human journey (both good and not-so-good). In doing so, Laura models for her readers a meaningful way to live the Christian life—remembering where we've been, and then reflecting on God’s presence throughout the journey. Laura has arranged her book in sections, each with the heading of biblical virtues (Faith, Hope, Love) or cardinal virtues (Prudence, Justice, Temperance, Courage). Each chapter, with portions of her own life story and faith journey woven beautifully throughout, is followed by probing and thoughtful questions. These reflection questions excellently prompt the readers to pause and do some reflecting of our own. The questions are also ideal for group study, for one can immediately see their endless conversational potential. As someone who went to college in Kentucky, and has spent considerable adult time there, I was quickly drawn to Laura’s story of moving back home to the Bluegrass state (even though my team colors are blue while hers are red). And as the father of two daughters, I found her stories of Téa both hilarious and deeply moving. Rev. Barclay writes not from a position of privilege, or someone who’s “arrived,” or someone who has it all figured out. Instead, she comes across as a fellow traveler on the road. In reflecting upon her own life and God’s call upon her, Laura invites us to do the same. While Laura’s story is certainly her own, in the beautiful telling of it, she allows me to see my own story in hers. And perhaps that’s the greatest gift of this book.